Discover beautiful blues this season with this stunning jacket by revered designer Marina Rinaldi. 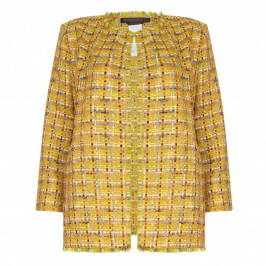 Striking in a tweed fabric, this lurex jacket comes open front with two patch pockets. Ideal for smart/casual wearing, style with a pair of faded blue slim fit jeans and complete with heels for that elegant finish. Blue tweed lurex jacket. 35% Cotton, 22% Viscose, 18% Polyamide, 8% Wool, 7% Polyester, 6% Metallised Fibre, 3% Linen, 1% Silk. Do Not Wash with Water. Delicate Dry Clean Only.